Series edited by: Norbert Cyffer, Osamu Hieda, Angelika Mietzner, Doris L. Payne, Anne Storch. Nilo Saharan is a problematical term for a hypothetical language family, stretching from the central Sahara southeastward to Tanzania. The series contains grammatical descriptions, linguistic reconstructions, dictionaries and conference proceedings. Edited by: Helga Schröder, Prisca Jerono. 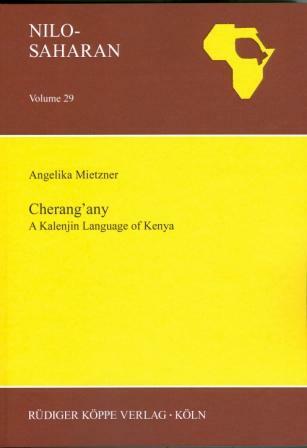 With contributions by: Samuel Beer, Gerrit J. Dimmendaal, Joelle Goldberg, Justin M. Goldberg, Anne-Christie Hellenthal [show more…], Angelika Mietzner, Moges Yigezu, Jonathan Moodie, Jane Akinyi Ngala Oduor, Manuel A. Otero, Maren Rüsch, Helga Schröder, Justine M. Sikuku, Anne Storch, Christine Waag, Joseph M. Wanyonyi. Edited by: Angelika Mietzner, Anne Storch. With contributions by: Colleen Ahland, Adelino Amargira, Gregory D.S. Anderson, Pascal Boyeldieu, Nate D. Bremer [show more…], Stefan Bruckhaus, Richard Griscom, Prisca Jerono, Andreas Joswig, Don Killian, Chelimo Andrew Kiprop, Diane Lesley-Neuman, Angelika Mietzner, Moges Yigezu, Susanne Neudorf, Russell Norton, Jane Akinyi Ngala Oduor, Manuel A. Otero, Doris L. Payne, Martin Phodunze, Terrill Schrock, Helga Schröder, Anne Storch, Christine Waag. Edited by: Al-Amin Abu-Manga, Leoma Gilley, Anne Storch. With contributions by: Suzan Alamin, Adelino Amargira, Sergio Baldi, Abeer Bashir, Herman Bell [show more…], Ali Obeid Birema, Roger M. Blench, Pascal Boyeldieu, Rihab Yahia Dafalla, Nicky de Jong, Khaliifa Jabr el-Dar, Edward Hall, Marcus Jaeger, Angelika Jakobi, James Lokuuda Kadanya, Eileen Kilpatrick, Constance Kutsch Lojenga, Richard A. Lobban, Robert Guy McKee, Farid M.A. Mekkawi, Pierre Nougayrol, Suleiman Norein Osman, Eva Rothmaler, Timothy M. Stirtz, Anne Storch, Christine Waag. Edited by: Doris L. Payne, Mechthild Reh. With contributions by: Václav Blažek, Roger M. Blench, Pascal Boyeldieu, Michael Bryant, Niels Christiansen [show more…], Regula Christiansen, Achim Diehl, Leoma Gilley, Gumma Ibrahim Gulfan, Jan Henrik Holst, Piet Huttenga, Muhammed Abbaker Ismail, Roland Kießling, Constance Kutsch Lojenga, Doris Löhr, Robert Guy McKee, Cynthia L. Miller, Moges Yigezu, Claude Rilly, Fedor Rozhanskiy, Anne Storch, Rainer Voßen, Doris Weiss, Petr Zima, Joost Zwarts. Author: Angelika Jakobi, Joachim Crass. In collaboration with: Bakhit Seby Abdoulaye. Author: Chet A. Creider, Jane Tapsubei Creider. Author: Mechthild Reh. In collaboration with: Sam A. Akwey, Cham U. Uriat. Edited by: Gerrit J. Dimmendaal, Marco Last. With contributions by: Jon Abbink, Jonathan Arensen, Gerrit J. Dimmendaal, Osamu Hieda, Marco Last [show more…], Deborah Lucassen, Moges Yigezu, Scott Randal, Peter Unseth, Hans-Georg Will. Edited by: Robert Nicolaï, Franz Rottland †. With contributions by: Al-Amin Abu-Manga, Anbessa Teferra, Torben Andersen, Rotimi Badejo, Sergio Baldi [show more…], Roger M. Blench, Pascal Boyeldieu, France Cloarec-Heiss, Gerrit J. Dimmendaal, Christopher Ehret, Marie-Paule Ferry, Maman Mallam Garba †, Gabriel Manessy †, Robert Nicolaï, Manuela Noske, Pierre Palayer, Franz Rottland †, Petr Zima. Author: Archibald Norman Tucker †. Edited by: Chet A. Creider. In collaboration with: E.D. Jakeyo Ang’ina, T. Okelo Odongo, J.N. Olum Oludhe.